When I first reviewed the Fane Medusa 150, though I gave it a pretty good rating at 4.5 Tone Bones, I wasn’t really blown away by its tone because of its big bottom end, and recommended that the speaker be put into a 2 X 12 balanced out by a speaker with more top-end sparkle. What I didn’t consider was how it could be used to balance out the tone of a naturally bright amp. Take, for instance, my review on the Aracom PLX18 BB Trem. One of the nits I had with the combo was that the Eminence Red Coat Red Fang was way too bright for the already naturally bright amp, causing me to bleed off highs when I was mixing the song. FYI, EQ’ing my guitars in my recordings is usually a real no-no with me because I like the pure sound of my guitars and amps on a recording. The only things I’ll add in production are reverb or a touch of delay if necessary. I love the tone of the PLX18, but that speaker just didn’t work for me. Enter the Fane Medusa 150. That speaker is actually on loan from Tonic Amps. I’ve actually had it for a few months now, and I keep on forgetting to drop it off at Darin’s new place. Well, it looks like I’m probably going to buy it off him after all because I swapped out the Red Fang for the Medusa 150 in the PLX18, and suddenly the seas parted and a way was made clear! The PLX18 tone was completely transformed! Instead of being a purely bright amp, the PLX18’s tone became much more balanced. The highs and high-mids were still present but were much more tame. This resulted in a much richer tone. As you may know, I’ve been working on a new song called “Strutter.” I actually had the song completely recorded, but I hadn’t finished it because I just haven’t been completely satisfied with the lead guitar tone. When I got the PLX18, I knew it would be the amp I’d use to record the song. But with the stock speaker, and even with my Jensen P12N, it still wasn’t cutting it for me. I even mentioned that the amp loves the Red Coat “The Governor,” and it does, but I still wasn’t completely satisfied. Now, with the Medusa 150 in the cabinet, I’ll be completing the song. Let’s compare, shall we? Sorry for the differences in volume levels. But where the Red Fang has much more presence, and an in-your-face presentation, the Medusa’s tone is so much more three-dimensional and more refined. The mids and highs are still present and incredibly articulate, but they’re so much less piercing! 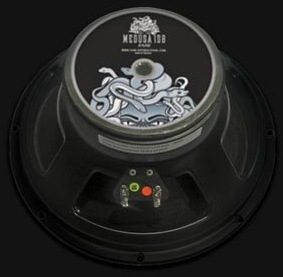 And one thing that I noticed immediately with the Medusa is the clarity of the notes through the entire EQ spectrum, whereas the Red Fang seemed to lose a bit of clarity at high-gain settings – especially when I play those transition chords. Note that the amp and mix settings stayed completely the same between the two recordings, and both guitars were played through the Trem channel which was completely dimed. I also removed the wah from the second clip because I didn’t feel the need to mix it up. For that part, I did stack my KASHA Overdrive and Geek Driver overdrive pedals, but set to unity gain, and to add just a touch of compression and sustain. Not much, but just a touch. So what’s the moral of the story? Simple: Amp and speaker combinations are critical to good tone. Some speakers, like my P12N work with a bunch of different amps. But some speakers, like the Medusa, work much better at balancing out certain amp characteristics. I’ve learned a good lesson here: You have to try out gear in different configurations and situations. Had I not tried to experiment with the Medusa, I probably would’ve just passed it off as a good speaker that belongs in a 2 X 12 cabinet with a bright speaker. For more information on Fane speakers, talk to Darin at Tonic Amps! Tonic is the North American distributor for Fane speakers. 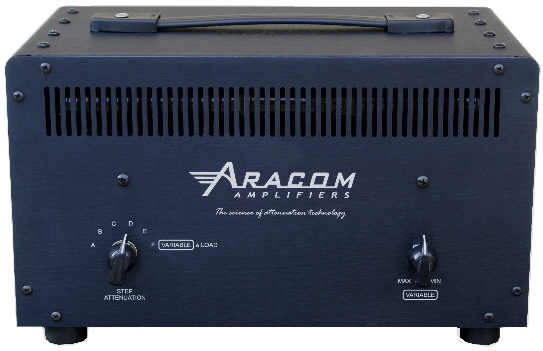 For more information about the incredible Aracom PLX18 BB Trem, please go to Aracom Amplifiers. By the way, both clips were recorded at conversation levels using the fantastic Aracom PRX150-Pro attenuator, by far the best attenuator on the planet, from my perspective. I just couldn’t live without this device!